The city of Laramie, Wyoming, is known for its natural beauty, bucolic lifestyle, high elevation and colorful history. It is the site of the state’s only university, and has developed a reputation as a preferred place to retire. This is especially true if you enjoy the small-town vibe and beauty of this high desert mecca. Such was the case for the family of saxophonist Kate Olson, her father choosing the city to retire from the Air Force after 20 years of service. Olson had spent her life on the move with her military family, beginning in California, and including a three-year stay in England. Arriving in Laramie as a seventh grader, she remained in the historic western city, eventually studying at the University of Wyoming. Indeed, her parents had found the ideal place to raise their daughter, free from the perceived mayhem of big city life. But while her family was settling into the certainty of retired life, young Olson was mapping out a life as an artist, a journey that would almost certainly pull her away from this idyllic setting. “They got stuck with this daughter who decided she wanted to be an artist, who was interested in making music and art and being weird,” recalls Olson. Adding to this eclectic mindset was her choice to explore music through her instrument of choice, the saxophone. She was a newly inspired female artist growing up in cowboy country, living on that societal edge through her studies. A decision to pursue graduate studies at the University of Michigan, Ann Arbor, provided a new perspective, in a social environment that embraced innovation, creativity, and individualism. Olson’s ears were opened by new sounds, providing the beginnings of her own personal artistic vision. Recordings such as Brian Eno’s Ambient 1: Music for Airports, and soprano saxophonist Steve Lacy’s Monk interpretive, Reflections, began to mold her evolving, yet still static musical persona. “I didn’t have a relationship with the music, except the music of Thelonious Monk, and Steve Lacy’s involvement with it. The way he played the music of Monk really spoke to me,” she says. Lacy’s sound would serve as a harbinger of things to come for Olson, who eventually identified the soprano saxophone as her choice. Even though her parents, and more specifically her mother, preferred their daughter engage in practical pursuits other than art, they still gifted her a Yamaha professional model soprano while still in college. Her mother simply heard and loved the sound. It was a gift so personal, so beautifully articulated, with her mother stating, “This is your voice.” Olson now had the means to use Lacy’s sound to assist in finding her own, using his unique tie-in to the entire jazz tradition. Her sound would reflect dixieland and swing, Monk and Cecil Taylor. The music became categorically homogenized, blending divergent paths into one. In time, it became clear that Ann Arbor was no longer providing the scene, and subsequent opportunities to perform, so following graduation, she headed to Seattle with a friend to explore the scene here. “I could see myself very easily being a middle America alcoholic that played community theatre,” says Olson. Seattle would be the perfect proving ground for her musical conceptions, providing an eclectic local jazz scene. Simply put, she could see that there was so much more to learn, and being in a city with so many like-minded souls sharing and embellishing their sound, there was so much space to grow and create. Olson’s personality is inward by nature. There is a reticence about her that is communicated through her playing. One gets the sense that her musical persona is slowly unraveling into abandon, her eclectic approach a mindful blend of melody and mayhem. 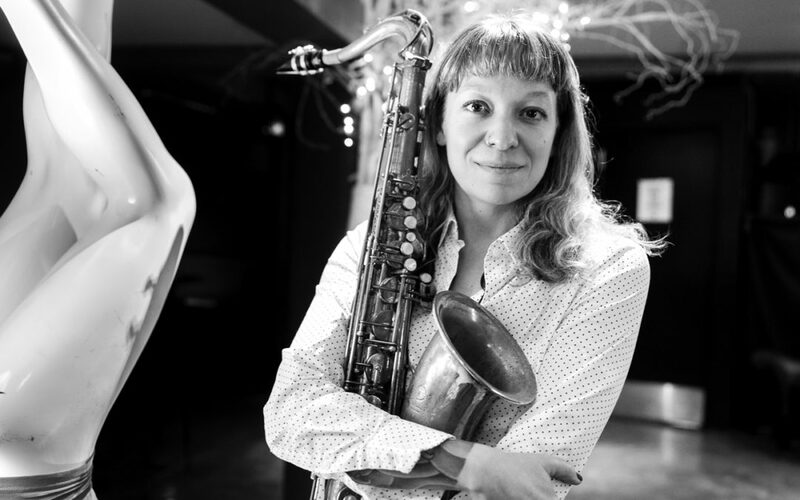 The beginnings of her integration into the Seattle scene came via the Racer Sessions, where she would meet like-minded souls like trombonist Naomi Moon Siegel and saxophonist Ivan Arteaga. While her meeting Siegel would evolve into the formation of the eclectic duo Syrinx Effect, it was there as well where she met Luke Bergman, who connected her with her first Seattle band, Ask the Ages. While Olson’s many projects include KO Electric, a solo project, and the aforementioned Syrinx Effect, it is her KO Ensemble that expresses her definitive compositional, and playing style. In pianist Alex Guilbert, bassist Chris Symer, and drummer Brad Gibson, Olson found the perfect pieces to map out her aesthetic vision. She didn’t want the band to play standards, so she set out to compose pieces with a loosely fitting harmonic structure to enable untethered improvisation. “The jazz aesthetic allows for imperfect performance in pursuit of the edge. I lean a lot on my rhythm sections to do their own thing. My job is the melody,” says Olson. Guilbert, Symer, and Gibson interpret her work in a way that makes sense to her. “I know when I play with Chris and Brad, that everyone is listening and paying attention. They’re joking with each other the entire time. Their bond is so strong. I want them to be doing their thing with Alex and I riding on top of it,” she adds. Olson sees the band as extending beyond her own leadership. “It’s a way to document what is going on with my generation of Seattle jazz musicians, KO Ensemble became a way to play original compositions, and original compositions by my friends,” she says. While seeing things in terms of community, Olson has evolved into an engaged bandleader, aside from her prowess as a writer and player. “For me to work in this town, I have to hold myself to a higher standard. I’m not saying because I’m a woman, or a soprano player, playing an instrument nobody needs. I have to be the most reliable, the most prepared, the most punctual, the most in tune. I have to be easy going. You have to constantly be reminding yourself to not take things personally,” she remarks. December found Olson writing and performing for the annual celebration, Land of the Sweets: The Burlesque Nutcracker at the Triple Door. The challenges as a writer are different and exciting. “Since we’re working with dancers, the tempos have to be the same every time, it has to basically sound the same every time because dancers are very much cueing off what we are playing. It’s a challenge to myself to do something different every time,” she says. This is a remarkable contrast to her usual approach that features a sense of elasticity to time and space. KO Ensemble will be featured at the monthly Art of Jazz series on January 10 at the Seattle Art Museum. The band is swiftly becoming the perfect culmination of her many streams of musical thought in cohabitation together, like two forks of a river uniting and creating a main flow, integrating strength into her musical personality. What merges and interacts with that flow will continue to impact Olson as a composer and improviser downstream and beyond.